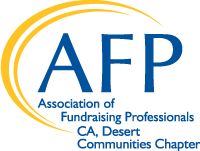 The AFP Desert Communities Chapter offers a robust schedule of education programs to its members and colleagues in the fundraising profession. Check back here often to find information about programs to enhance your technical skills, manage your career, expand your perspective and inspire your efforts as a fundraiser. With input provided by some of the leading fundraisers in the philanthropic community, AFP’s education programs provide an ongoing source of professional wisdom. Virtually all of our programs are approved for CFRE Credits. CFRE is "Certified Fundraising Executive" and is the only internationally recognized professional credential for philanthropic fundraising executives. Fundraisers with this designation have completed educational courses and an examination of their skills and knowledge of fundraising and ethics in fundraising. January 14 - Social & Educational Event in Indio, 5-7 p.m.
Our chapter meetings are held on the 3rd Friday of every month except July, August, November and December. All educational sessions are accredited by CFRE for continuing education credits.